A special afternoon of Jewish musicby 20th and 21st century composers, this program presents extraordinary Jewish instrumental and vocal works by several of the most important and exciting composers of our time: Pulitzer Prize-winning composer Yehudi Wyner’s Fantasies for Piano, selections of Benjie Ellen Schiller’s vocal music, Joshua Fishbein’s Adon Olam for Voice and Piano, Ronn Yedidia’s Concertino for Clarinet, Strings and Piano, and Jonathan Leshnoff’s Clarinet Concerto. Performers will be composers Yehudi Wyner and Benjie Ellen Schiller, pianists Elizabeth Hill and Stas Fridman, clarinetist James Logan; plus clarinetist Ziqi Yue, violinist Amos Lee, violist Seo Hyeon Park, cellist Christine Chen, distinguished artists from the Mannes School of Music. Your 2016-17 membership dues (Sept. 1, 2016 - Aug. 31, 2017) are an essential part of the funding that allows the American Society for Jewish Music to continue to operate. Membership dues support the annual Chanukah Concert and our contemporary concert Music in Our Time, among others during the season. 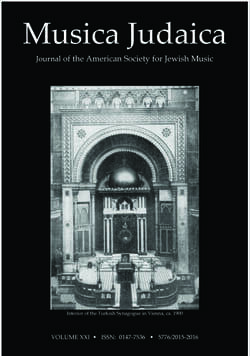 The sessions of the Jewish Music Forum, both at home and "On the Road" are also supported by dues from members. And, importantly, the information and access we provide without charge to the St. Petersburg Score Collection, the Charlie Bernhaut Collection of Jewish and Cantorial Recordings, as well as a host of other activities and services which help keep Jewish music alive. You can join the Society, or to renew your membership online, or download the membership form and mail it in.